Are you sick and tired of those stupid tiles not being animated? Wish you could just set up an animation strip and be done with it? Well now you can! With the animated tile scripts, you can have tile animations set up in no time. How does this tile animation work you might ask? Just like sprite strips. You just need to set up your tile animations from left to right in the background editor, and you're ready to animate them. You can set the animation speed just like a sprite, and even have the animation play in reverse. Want to change the tile speed after you initialize it? You can do that. Change the index? You can do that. Don't want the animation to loop, but want it to reverse? Just set one argument in a function and it's done for you. 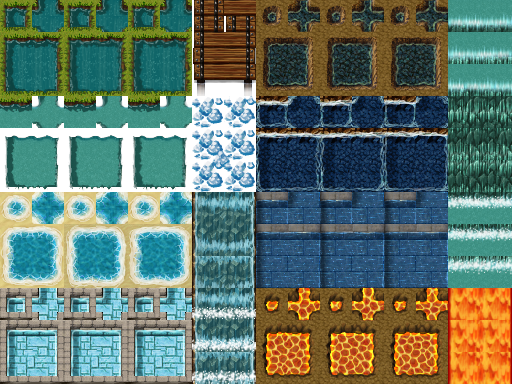 You can animate all tiles on a background, tiles on a certain depth, and much more. Why bother making eight different sprites, or using alarms at different times to change your tiles when you can have it done in a few function calls? So what's in this demo? The demo contains a background set up as an animation strip for your reference. Two objects showing off the slow functions, and the 'auto-animating' tiles. Finally, the room contains over 1200 tiles being changed with the slow functions, and 28 tiles being changed through 'auto-animation.' Help document describing all the functions and setup for auto-animation is included. I'm also looking for feedback on functions others may want, so I'll try to implement suggested functions. No change in scripts, just appearance. Added scr_tile_animate_empty() to check if tile animation data has tiles. scr_tile_animate_update() will only update animation data that has tiles. Added functions for scaling, blending, and alpha for animated tiles. Fixed error caused by inputting a non-integer value into the index argument of scr_tile_animate_new_* functions. Changed demo so you can test performance of self animation versus the first four animation scripts. Comments in script referenced wrong argument name. Constants (macros) were not in package. Can not seem to export things from an extension package I create, so macros are currently global variables. Edited by smash ball, 30 August 2014 - 02:15 PM. Constants are now added to the extension file. You can add tiles and tile groups to existing animation data. Previously, you could only create animation data and destroy it, but could not add more tiles in after creation. Added function to set the start and end animation position of the tiles. I bought your script in the marketplace. I'm still studying how it works, but I did not understand the script serves to make the animation of a tileset in 03 frames. You can use the script to make the animation of this Tileset without having to divide it into several parts? If possible, what should I do?